Today we are kicking off this year's 100 Acts of Kindness Project! 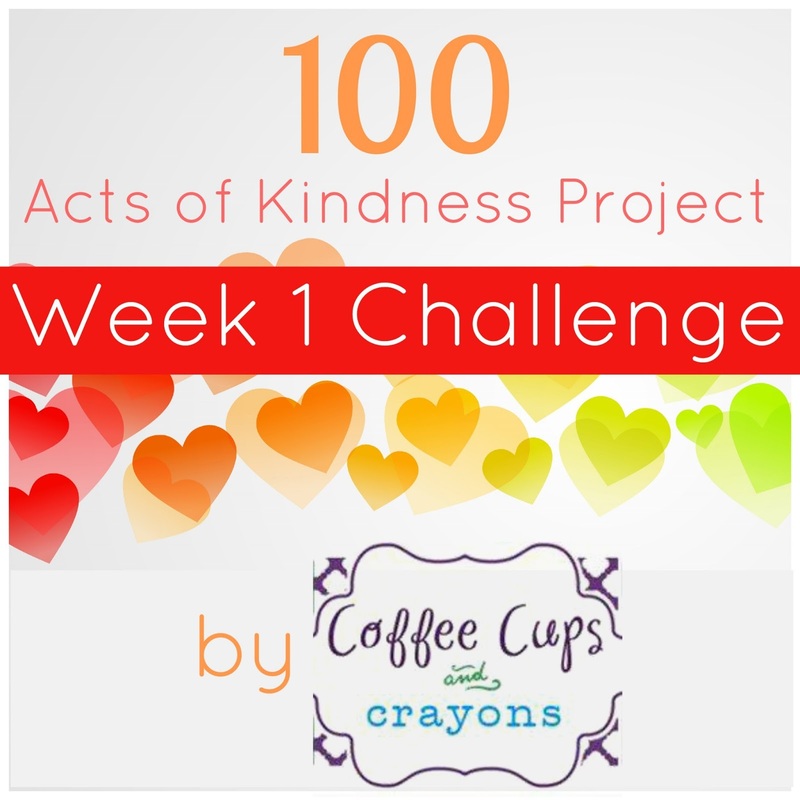 Each participant is challenged to accomplish 100 Acts of Kindness over the next four weeks and participate in each weekly challenge (there will be four simple ones). 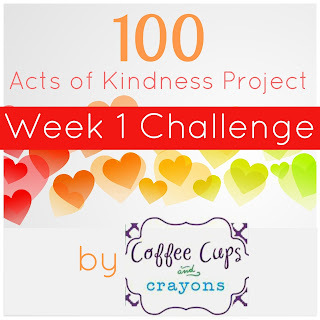 Our Kindness Challenge for Week 1 will be issued by Megan of Coffee Cups & Crayons. Megan has an incredible blog where she shares everything from birthday party ideas, to learning activities, to pictures of dessert tables (totally my sorta friend :)). She is also celebrating 2013 with 52 Weeks of Random Acts of Kindness, so I knew she'd have a great challenge for us! Click on the photo below to find out our Kindness Challenge for Week 1 and then come back and tell us how you are going to accomplish it! In addition to accomplishing our challenge this week, make sure you get started doing 100 Acts of Kindness and recording them! What are simple acts of kindness that you or your kids already do? Are there things you could do better? How do you plan to keep track of your acts of kindness? I am so excited that you chose to join us in this challenge. If you are just finding out about our challenge, head on over to our 100 Acts of Kindness Challenge landing page to find out all of the details and stay up to date. The sneak peek is so cool! I love it! I have a funny story about keeping track of the acts. We were going to put up an uniflated balloon on a hundreds chart and then play with all 100 balloons on the 14th to celebrate. Then my husband informed me that he could not blow up 100 balloons for me on the 13th after the kids went to bed! Ha! We're going to use stickers instead and he's going to blow them up as we go and we're going to store them in a garbage bag until the kindness celebration! Here's my attempt! http://www.poeticaperture.com/2013/01/25/week-1-kindness-challenge-the-environment/ Fun fun fun! My munchkins and I will be joining in. We will start Monday (a week late, but we will quickly catch up). We will track our kindness and good deeds will hanging hearts from our ceiling. We already hang balloons for our party so the hearts will be a great addition for our party and to show parents and to remind us daily how well we are doing. I will send a few hearts home with each child so maybe it will encourage parents to particiapte and remind our munchkins that kindness never ends. My munchkins and I will be joining in. We will be starting on Monday (a week late, but we will catch up). We are going to hang hearts from the ceiling with our kindness or good deed written on it. We already hang balloons for our party for this will be a nice added decoration and a constant reminder for parents and munchkins to continue their kindness and deeds. I cannot wait to get started.